So you found an old Chevy truck sitting in a barn or field. Or perhaps you inherited one from a relative, and intend to fix it up, get it running again, and make it look really great. As you start doing your research on restoration and parts, and how much it’s all going to cost, you immediately run into one of the most common questions anyone working on an older vehicle has. Do you use OEM (original equipment manufacturer) parts, or do you buy aftermarket parts? Which one is the right choice? Is your truck worth more with one or the other? What about custom modifications? The answer is, like many other automotive questions, it depends. 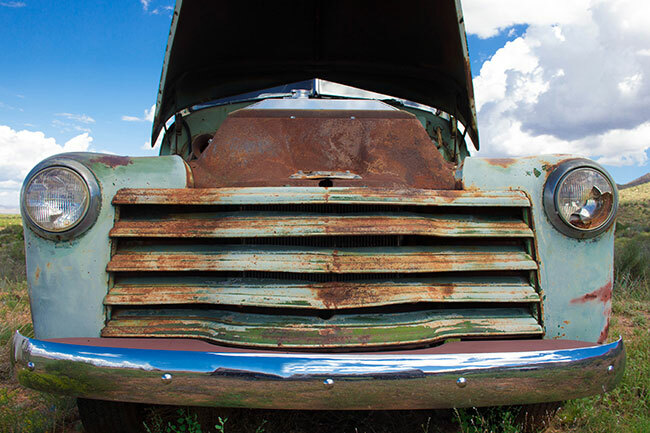 Here are some things to consider when choosing whether to use original equipment or custom and aftermarket parts when restoring your old Chevy truck. There are dozens of examples. While in some cases there are aftermarket options (like grills) that are less desirable when doing a restoration. Other parts aren’t even made by aftermarket manufacturers, so if you can’t find one, you have to have it made, or improvise. Availability is just the first of many issues, but sometimes you have to take what you can get, OE, aftermarket, or custom, based on what’s available rather than what’s ideal. OE parts are made by Chevy, GM, or Delco in most cases. Sometimes carburetors are made by Holley depending on the vintage, engine, and model options. The OEM parts are the ones that come from these vendors, and can often be found at dealerships, swap meets, or from online catalogs who bought up OEM surplus and now sell them to those doing restorations. If you have a hard time finding something, often your local junkyards will have a database and can, in some instances, help you find used parts. Your local body shop may also have a network of sources and be willing to work with you to find what you need. When it comes to aftermarket though, things get muddier. There are hundreds of vendors of various reputation, quality, and cost. The rule of thumb is to do your research. Find out who offers both quality and a good price and look at online reviews and forums to see what other owners recommend. Purchase carefully and be sure to look over return policies in case something doesn’t fit. One of the most critical things during a restoration is find a good, reliable vendor. The biggest advantage of OE parts is, provided you ordered the right part for the right year and model (often its own challenge), they will fit and the finish will match the rest of your truck. Aftermarket parts are a gamble. Even small discrepancies in measurements or placement of fasteners can make a part fit, but not look or work perfectly. This often means inconvenient modifications or worse, having to scrap the part and continue searching for a different one. Even if you’re able to return it, the time lost has its own cost. Finding the best fit and finish usually means OE parts from a reliable aftermarket vendor. There’s a difference between a restored vehicle and a modified one. In a full restoration, it means getting the vehicle as close as possible to the original. OE parts are used whenever possible, and original engine specifications, carburation, and transmissions are adhered to whenever practical. A modified vehicle may be one that’s lowered, has a “chop-top” roof, or has a more modern motor and transmission combination. Interior modifications are also common, making it appear retro while adding modern touches. Part of the reason modifications are so popular is part availability, how much it costs to have them made, and finding used OEM replacements. Dashboards, seats, flooring, and controls are often modernized or adapted from a more contemporary and common vehicle. This brings us to the final choice, and one that’s often filled with controversy. Yes, a 1955 Chevy truck with the original engine and carburetor setup is really cool and more of a restoration than one with modern touches. However, there are some sacrifices. Those trucks were never meant to travel at today’s speeds, so gearing and transmission options create limitations. Fuel injection has some fabulous reliability benefits and is relatively easy to add to almost any vehicle. Tires and wheels are another factor: split rims on heavy-duty trucks are difficult and even dangerous to work with. No wonder they’re known as “widow makers” by those who work with them. Today’s tires have better tread, last longer, and offer better options for many applications. These are all things to consider when deciding whether a restoration or modification is right for you, and when choosing the parts you’ll use to complete your project. Original vs. OEM parts is not a question with a clear answer, except that usually, OE wins out when possible. The aftermarket has its place though, and if you plan to do any modifications, those vendors may be your answer.